These uniforms are tailored by the Quartermaster Shop from Port Huron, Mi. The Garments we sell are the highest quality available today. Careful attention is paid to every detail to ensure museum quality and authenticity as well as wearability. Please adhere to our ordering instructions so that we may deliver proper fitting garments the first time. Don't guess. Give modern clothing sizes in the space provided. Usual shipping time on custom orders is 6 - 12 weeks. Common sizes and items off the rack can be shipped immediately. Please also note that larger or odd sizes could cost extra. Artillery Jacket in Medium Grey Wool with optional Corporal stripes. Our early war jacket reflects the militia image of a "romantic war". 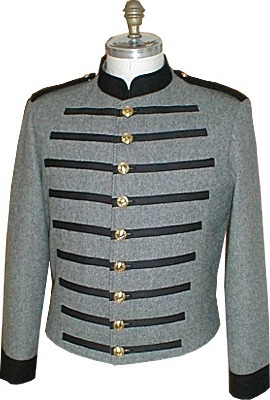 Jackets have more trim, more buttons, and in many cases were designed by the militia units themselves. Two examples of our typical Early War reproduction of Early War Militia jackets from Virginia and Mississippi (both reproductions) are shown to the right and at left below . Our jacket is made using 19 ounce field service wools. The jacket is lined with cotton muslin and has an inside left breast pocket. 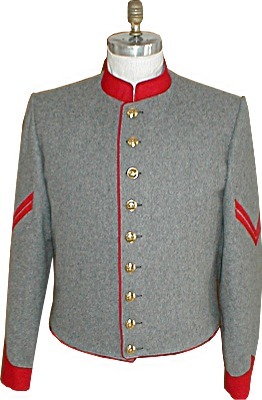 It is a bit longer in the waist than some of the later issue jackets, and comes with branch of service colors on the collar, cuffs, and edge piping (piping runs down the left front and around the bottom). 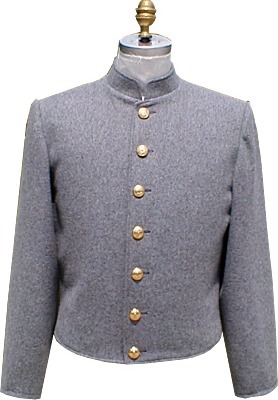 Our typical Early War jacket has a nine-button front with two small buttons on each cuff. CSA buttons are supplied but not sewn on. All jackets are cotton lined and custom made for each individual order. Please allow 6 - 12weeks for delivery. Because custom orders are not returnable, please visit our measurement page, and submit your measurements. Early War Jacket of the 11th Mississippi Infantry starts at $55.00 addl. Mississippi adopted red as the trim color for Infantry rather than Light Blue. 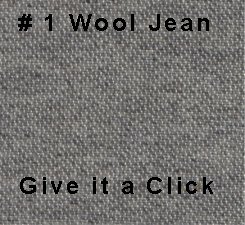 Shown in #1 Grey Wooljean with the Wood button option. (Mid thru Late War)- Made from wool jean fabric having a 2/1 twill weave. In wool jean, the up and down threads are cotton and the side to side threads are wool - making the jacket somewhat lighter in weight than an all wool jacket. Six piece body construction with 7-button front, no cuff buttons. Other variations can be made at time of manufacture. A natural cotton muslin lining and inside left breast pocket is standard. CSA Buttons are supplied but not sewn on. please visit our measurement page, and submit your measurements when you order. Shown in Brown Wool jean with optional right side pocket and Wood buttons. 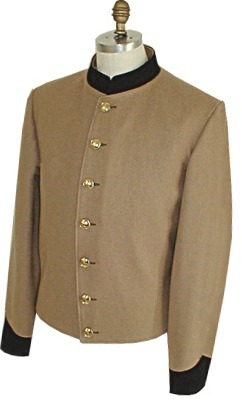 Custom Jacket in Tan Butternut with black collar and cuff option. (Mid thru Late War) - Made from our quality 19 ounce field service wool with a natural muslin lining and inside left breast pocket. The jacket features a six piece body construction with 7 button front, no cuff buttons. CSA Buttons are included but not sewn on. Please allow 6 -12 weeks for delivery. Because custom orders are not returnable, please visit our measurement page, and submit your measurements. Although issued to many units in the Army of Tennessee, the various Columbus Depot jackets are often referred to as the �Orphan Brigade Jacket�. From research to date, all jackets issued were made using a wooljean fabric and had either the Medium Blue collar and cuffs or were without any trim color. 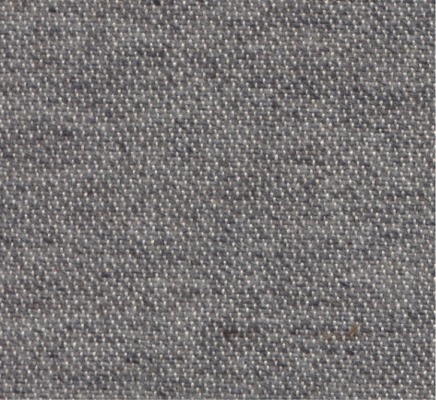 Wooljean is a fabric that has a wool warp and cotton weft. So even if you portray Cavalry or Artillery and wish to use this jacket, the medium Blue trim color or no trim colors is the correct pattern. 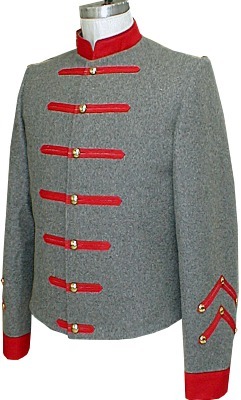 Typically worn by units in the Army of Northern Virginia, Richmond Depot jackets feature a 6-piece body and 2-piece sleeve construction and usually a 9-button front. 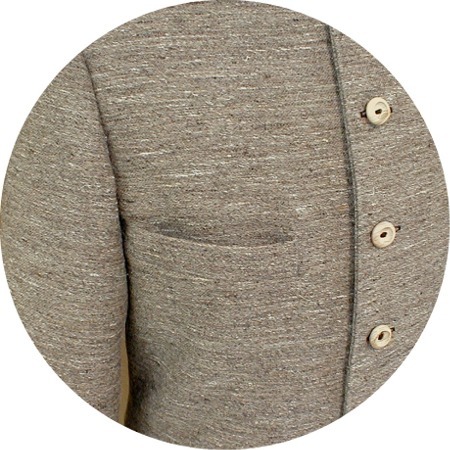 Bottom of jacket has a corner (square cut), and is cotton lined with an inside left breast pocket. Atlanta Depot Jacket is shown above in Medium Grey Wool. 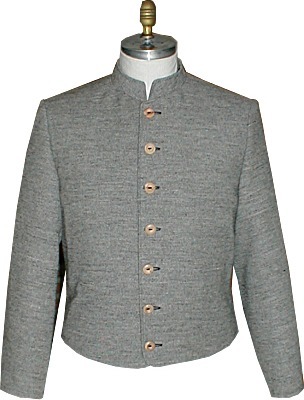 (Mid thru Late War)-A basic "salt and pepper" gray jacket without trim colors. We offer both a wool version and a wool jean version. Both jackets feature a six piece body, one piece sleeves, six wood button front and cotton lining. The back of the jacket angles to a point- similar to the Columbus Depot I Jacket. 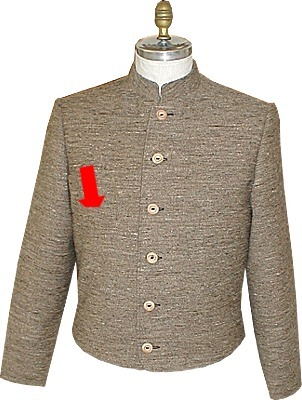 A peculiar feature of this jacket is that the front edge of the jacket on the left side aligns with the edge of the collar, causing the front edge of the jacket to fall off the centerline of the body. Although somewhat different in design, this jacket saw considerable service in Western theater operations. All CS Atlanta Shells are custom order. Please allow 8 weeks for delivery. Because custom orders are not returnable, please visit our measurement page, and submit your measurements when you order. (Probable issue period Late 1863 to end of war).-The Alabama Pattern Jacket is associated with units of the Army of Tennessee that were assigned to the Alabama Department in December 1864. Our reproduction is made from natural wool jean and has a six-piece body, two piece sleeves and cotton lining. Only the collar is trimmed with dark blue wool jean. The coat front features five wood buttons and has an exterior pocket. This jacket has a short waist length, the body being about 1shorter than the Columbus Depot I Jacket. The back is cut straight across, rather than to a point. A single belt loop on the left side is available at no extra cost. All CS Alabama Shells are custom order. Please allow 8 weeks for delivery. Because custom orders are not returnable, please visit our measurement page, and submit your measurements when you order. Button Note- All of our coats come complete with buttons. US coats come with appropriate eagle buttons. CS Coats come with your choice as listed.